And while those energy beams that look straight out of a Dragon Ball Z episode are cool and all, I can't help but feel a bit more excited by the prospect of carrying around a haunted Pokedex. Okay, maybe not "haunted" per se - it's more like the Pokedex in Sun and Moon is a special home designed for the Pokemon known as Rotom. This special creature was first introduced in Pokemon Diamond and Pearl, where it took on different properties depending on the device it was inhabiting. Honestly, Rotom was kind of lame back then, because you were surrounded by mythical, impossible animals … but Rotom was, literally, a possessed lawn mower. Or fan. Or washing machine. But with the Rotom Pokedex, you'll have a Pokemon you can talk to and who will give you advice. This presents all kinds of new opportunities for human-Pokemon relations. The implications are monumental! 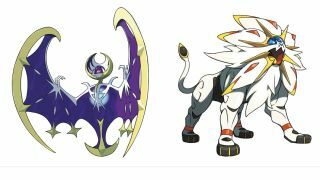 But sure, a sun-lion and moon-bat are neat too. I mean, I guess.